We didn’t know what to think about the Osmo Pocket when DJI announced the device earlier this month. It’s basically a tiny drone camera and three-axis gimbal on a stick. There’s a little screen so you can see what you’re filming and some smart features that help you track subjects. It’s not an action cam, the company told me. Then it clicked: this thing is a new kind of camcorder, and it’s awesome. Just in case that brief description of the £330 Osmo Pocket didn’t click for you, let me expound upon it. DJI revamped the 4K camera system that’s found on the Mavic Air and attached it to a handle that’s roughly the size of Snickers bar (after two bites). The handle fits neatly into your hand, yet surprisingly easy to hold. The touchscreen screen is also uncannily small. It’s the size of a postage stamp. Meanwhile, the entire device has just two buttons: one for record and one for power and switching between camera modes. There’s also a port for attaching accessories or a smartphone. 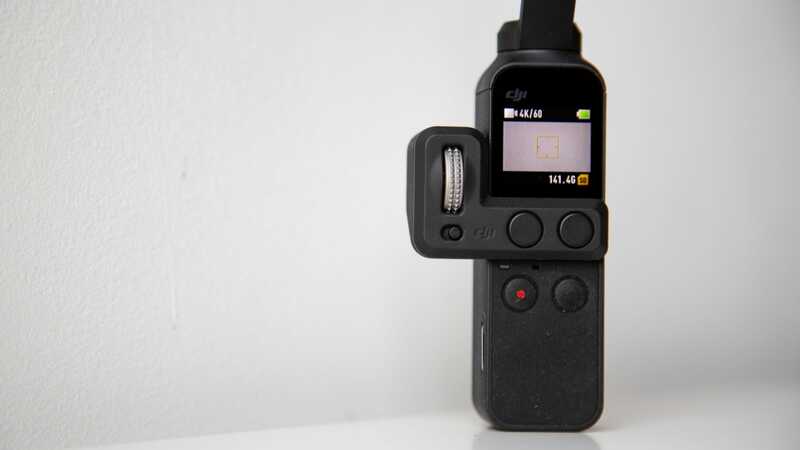 All that simplicity means that you can take the Osmo Pocket from, well, your pocket to shooting video in approximately three seconds. The shooting experience is equally breezy, as the camera system defaults to an automatic mode that takes care of white balance, aperture, and so forth. You can also change the camera to Pro Mode which gives you full control over the settings. Also, probably because it’s so small, battery life is limited to two hours when shooting in 4K, and there is not a removable battery. This isn’t the end of the world, but it’s a limitation for sure. It’s worth pointing out here that the Osmo Pocket is not the only Osmo. DJI has been building these handheld 4K cameras since 2015, although the other Osmo models are significantly larger. Seriously, the difference between the original Osmo (which is now discontinued) and the new Osmo Pocket is the difference between the size of a forearm and the size of a finger. DJI also has a version of the gadget called the Osmo Mobile 2 that uses a mobile phone for a camera and costs just £130. Suffice it to say, all of the Osmos are geared towards people who value high quality, super stable video. 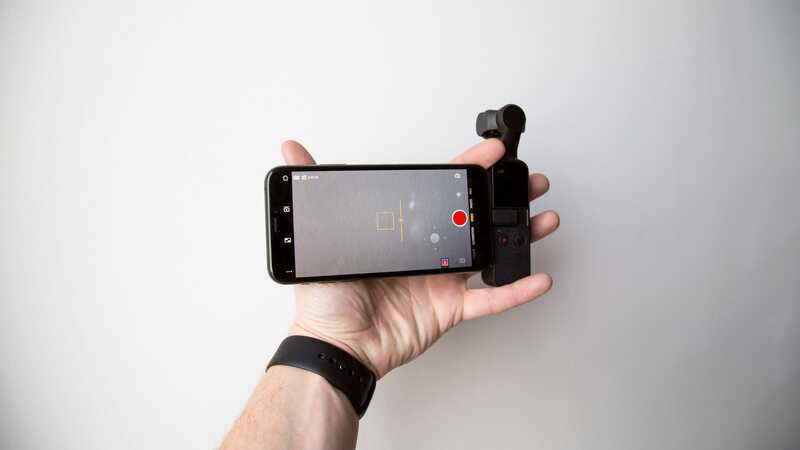 Any new smartphone can capture serviceable video, but by upgrading to an Osmo, you get that sweet three-axis gimbal and a new level of production value. The act of using the Osmo Pocket is honestly a blast. While we thought the tiny display was a little silly at first, it quickly proved to be an essential part of the device. The touchscreen not only meant we could frame our shot with a glance but also swipe between menus to access features like ActiveTrack which lets you select a subject and keep it centred in the frame. A similar feature called FaceTrack will keep your face in the frame when the Osmo Pocket is in selfie mode. There’s also something called First-Person View (FPV) mode that dials back the gimbal stabilisation a bit so the frame follows your perspective. These features add up to a pretty cool camera gadget, and honestly, we mostly enjoyed using the Osmo Pocket in the default mode. Things get even more interesting when you connect the camera system to a smartphone. 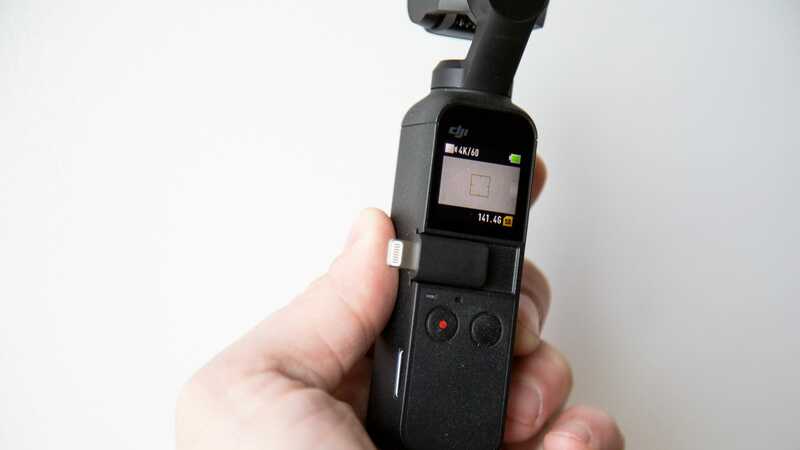 You can connect the Osmo Pocket to an iPhone or Android using a Lighting or USB-C dongle that comes in the box, and through a new DJI app, this turns your phone into a larger display for the Osmo Pocket. Holding it reminds me of the old Sony Handycams, where you’ve got the camera in one hand and the display in the other. 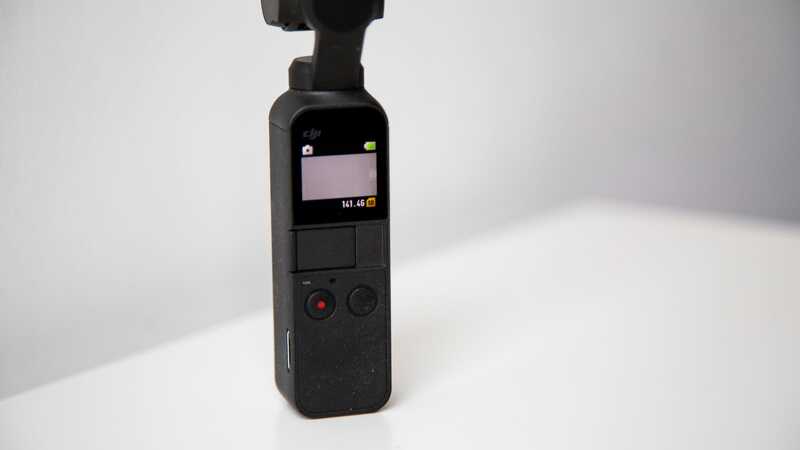 The major difference, of course, is that the Osmo Pocket setup is a fraction of the size and weight of an old camcorder, while the three-axis gimbal allows you to get effortlessly stable shots. 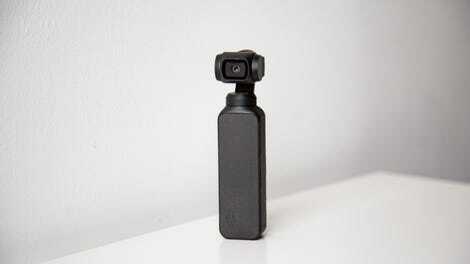 But again, we like using the tiny Osmo Pocket on its own for the sake of sheer speed and simplicity. Creative types will like the accessories, though. For this review, we tried out the £53 controller wheel accessory which gives you more control over the gimbal and a couple of extra buttons. If you’ve ever flown a DJI drone, it works a lot like the controller wheel on the remote that lets you pan the camera up and down, except there’s also a switch that lets you pan left and right. This is super useful if you have a specific shot in mind, and it’s super easy to use. 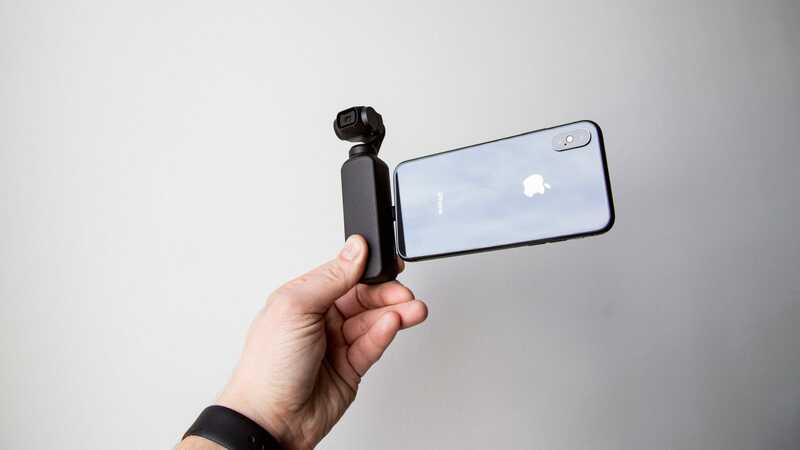 Other accessories include a wireless module that lets you connect to a phone from afar, a bracket for attaching to GoPro-style mounts, an ND filter set, an extension rod, and a wireless charger. We did manage to test out the wireless charger, which gives you a full charge on-the-go and works as advertised, but we haven’t tried anything else. Now, it’s time for some tough talk. While the Osmo Pocket is a brilliant little camera system, the little-ness of it does have some consequences. The camera itself features a 1/2.3-inch sensor with a f/2.0 aperture that performs fantastically in daylight but starts to struggle a bit in dimmer conditions. We noticed some noise and lack of detail in particularly dark shots. Low light and fast camera movements also leave some artefacts in the footage that won’t be obvious to most people but will be noticeable to camera nerds. This is a small gripe. Generally speaking, the Osmo Pocket camera captured terrific footage, and the pros of such a small, stabilised camera outweighed the cons of working with a compact sensor. For how well the Osmo Pocket performs, we’re left wondering what it’s best for. And the answer is: kind of everything. Birthday parties, beach vacations, concerts, Christmas morning—any situation that would have warranted a camcorder in the pre-smartphone era would be perfect for the Osmo Pocket. Because let’s be honest, old-school camcorders are simply awful, and smartphones aren’t great for shooting smooth video. The footage is inevitably jerky and even getting that footage is awkward since smartphones are designed to be looked at, not held like cameras. We should also highlight what DJI said about the Osmo Pocket not being an action cam because gimbals are inherently fragile. However, the gadget more or less as durable as a Sony Handycam so that you can take it places. If you like making videos, you should consider this gadget. 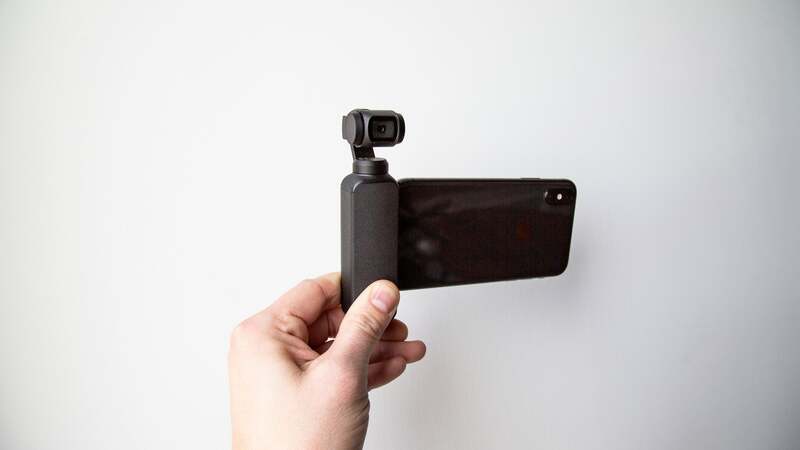 The Osmo Pocket is remarkably versatile and easy to use. It’s also so damned small; you could put it in your pocket. While £330 might seem like a lot of money to get a better version of the video camera that’s already on your smartphone, be honest with yourself. Your smartphone video camera isn’t great. You might want to invest in the camcorder of the future.